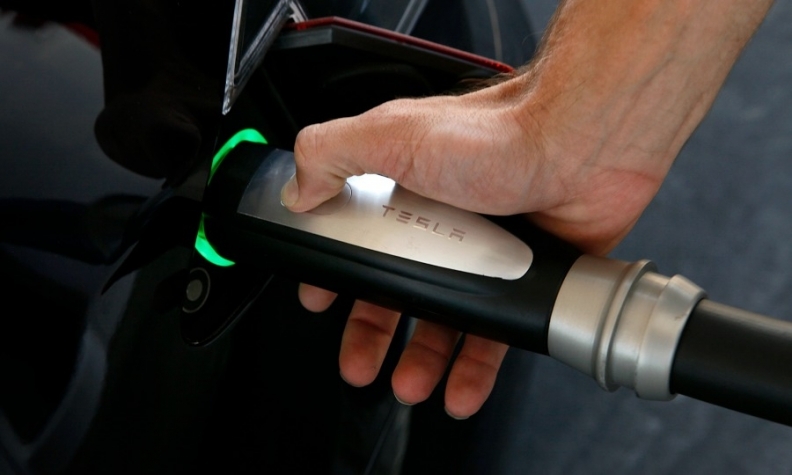 Tesla has its own plugs and communication protocols to link batteries to chargers. FRANKFURT – BMW, Daimler and Volkswagen Group hope a network of high-power charging stations they are rolling out with Ford Motor will set an industry standard for plugs and protocols and will give them an edge over electric-car rivals. At the moment, Tesla and automakers in Japan and Germany use different plugs and communication protocols to link batteries to chargers, but companies building the charging networks needed for EVs to become mainstream say the number of plug formats will need to be limited to keep costs down. To try to build critical mass for the Combined Charging System (CCS) favored by Europe, BMW, Daimler, Ford and VW, said in November they would develop 400 high-power charging stations on main roads in 18 European countries by 2020. "In the end, it is about safe-guarding investments for those that are investing in electric mobility," said Claas Bracklo, head of electromobility at BMW and the chairman of the Charging Interface Initiative (CharIN), which is backing CCS. "We have founded CharIN to build a position of power." Automakers behind the winning technology will benefit from having an established supply chain and an extensive network, making their vehicles potentially more attractive to customers worried about embarking upon longer journeys, analysts say. Manufacturers that back losing plugs, however, could end up with redundant research and development and may have to invest to adapt assembly lines and vehicle designs so their customers can use the most widespread fast-charging networks. Swiss bank UBS has estimated that $360 billion will need to be spent over the next eight years to build global charging infrastructure to keep pace with EV sales, and it will be key to limit the numerous technologies now in use. "The quick-charging marketplace might be growing fast but the issue of different types of connectivity and communication will need to be resolved going forward," UBS said in a study published this month. It is still early days for EVs and difficult to predict which plug technology will prevail or even whether there will always be different ways to charge vehicles, unlike the one-size-fits-all nozzle that can refill all gasoline or diesel cars. But there is a lot at stake for the automakers ploughing billions of dollars into the development of batteries and EVs. Besides CCS, there are three other standards that will charge batteries fast: Tesla's Supercharger system, CHAdeMO, or Charge de Move, developed by Japanese firms including carmakers Nissan Motor and Mitsubishi Motor, and GB/T in China, the world's biggest EV market. "I think over time CHAdeMO and CCS converge, likely into the current CCS standard, and the jury is out as to what will happen to Tesla," said Pasquale Romano, CEO of Silicon Valley-based ChargePoint, which runs one of the world's largest charging station networks. So far, there are about 7,000 CCS charging points worldwide, according to CharIN, with more than half in Europe. The European Union backs CCS as the standard for fast-charging but does not prohibit other plugs being installed. That compares with 16,639 charge points compatible with CHAdeMO - most in Japan and Europe - and 8,496 Tesla Superchargers, with the majority in the U.S. In China, there are 127,434 GB/T charging stations, according to the China Electric Vehicle Charging Infrastructure Promotion Alliance. Just as in previous format wars such as the battle for videotape dominance between VHS and Betamax, each charging standard has its pros and cons. Tesla's system is exclusive to its clients, for example, while CCS features a double-plug that can charge DC and AC, increasing the number of spots where drivers can recharge. CHAdeMO, meanwhile, allows cars to sell power from their batteries back to the grid, a process known as bi-directional charging that can help stabilize energy networks in times of demand swings and earn car owners some extra cash. "If I were Nissan, I'd be wanting to take that standard and make it the dominant one," said Gerard Reid, founder of Alexa Capital that advises companies in the energy, technology and power infrastructure sectors. "It creates a competitive advantage for them," he said. Most plugs used to charge cars at home use alternate current (AC) and are slow, so building networks that can power vehicles fast when on the road is seen as key by the industry, given many potential consumers still worry about battery range. Able to deliver more powerful direct current (DC), fast-chargers can load electric cars up to seven times faster. The fastest DC stations, capable of delivering up to 400 kilowatts, can recharge cars within 10 minutes, a vast improvement on the 10-12 hours it can take to reload at some AC charging points today. Developers hope drivers will feel more confident about undertaking longer journeys if they know they can reboot with a quick pit stop similar to stopping at a gasoline station. With that in mind, the joint venture set up by the German automakers and Ford to install CCS fast-chargers has teamed up with companies that have service station networks in Europe: Shell, OMV, Germany's Tank & Rast and retailer Circle K.
For traditional automakers, getting ahead in the EV race is also about staying relevant in an industry that has been shaken up by Tesla. Elon Musk's company is now worth $11 billion more than Ford, even though Tesla delivered just 76,230 cars in 2016 while the U.S. car industry pioneer sold 6.65 million vehicles. The German automakers teaming up with Ford, however, believe their deeper pockets should give them the upper hand in the long run and they see charging technology as an important factor in the fight. For now, CCS, Supercharger and CHAdeMO plugs continue to be installed in Europe as well as the U.S., while China is pressing ahead with GB/T, suggesting it is too early to call a winner in the plug wars - especially as no automaker will want to lose out on the Chinese market. Tesla, for example, said in October it was modifying its Model S and Model X cars for China to add a second charge port compatible with the country's GB/T fast-charging standard. Most other rivals are also incorporating the GB/T standard into their vehicles for China, which has ambitious quotas for EV sales, although some industry officials still hope the country will adopt one of the other standards at some point. While sticking with developing its proprietary network for now, Tesla is a member of the CHAdeMO and CharIN initiatives. It is also selling adapters so owners of its cars in North America and Japan can use CHAdeMO charging stations. Tesla declined to comment on whether it would consider joining a rival charging standard at some point, a move analysts say could be a tipping point in the race for plug dominance. "For Tesla it was always very important to have a charging infrastructure for our clients from the get-go," a spokeswoman said, adding that it welcomed all investment in car charging. Tomoko Blech, who represents CHAdeMO in Europe, said fussing over which standard would prevail was not helpful given that the EV industry was still in its early days and automakers should fight it out with their models. Some also argue there will always be several ways to charge battery-powered cars. "If you drive a petrol car you can fuel it any place in the world. This is the best you can get," said Nicolas Meilhan, principal analyst at consultancy Frost & Sullivan. "You will not get that for electric vehicles."